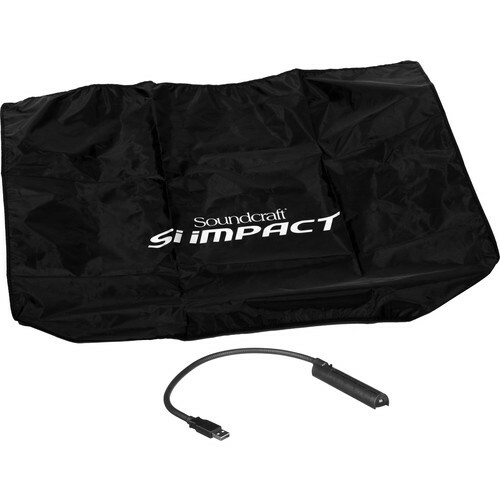 The SI Impact Accessory Kit from Soundcraft includes a vinyl dust cover and USB gooseneck LED lamp that plugs directly into the console and illuminates the controls for low-light environments. Box Dimensions (LxWxH) 14.3 x 7.8 x 1.3"
SI Impact Accessory Kit with Cover and LED Lamp is rated 5.0 out of 5 by 2. Rated 5 out of 5 by Rocko Records from Shipped Fast and Exactly What I Wanted I use my console for national touring acts and I needed the dust cover and specific lamp for my board. I found the website product fast and it shipped fast, opened the well-packaged product and it was just in time for a sold-out show. I was surprised with the lamp, it comes with an on, low light and bright light setting. So that was a plus. Thanks B&H Photo and Thanks Soundcraft! Rated 5 out of 5 by Anonymous from Awesome! Wonderful Investment and Quick Shipping! Will buy again!